The classic press-up, or push-up in the US vernacular, has survived the test of time, and is the single most efficient exercise to simultaneously strengthen the chest, arms, deltoids, lower back, abs and the glutes. In simple terms, an equal effort is required to lower your body and raise it back up, and it is this controlled pace that works muscles as a team through three types of muscle-building resistance – concentric, eccentric and isometric. The benefits of press-ups are plentiful. Press-ups will improve muscular endurance within the upper body, strengthen both muscles and bones, create lean muscle mass that raises your metabolism and, of course, help keep you fit and healthy. If you are just looking to develop a great chest, arms and shoulders, you could do much worse than press-ups. You will also be surprised as your core strength increases too. People lose up to 2% of muscle mass per year, eventually losing as much as 50% of muscle mass in the course of a lifetime. The effects of losing muscle mass include a decrease in strength, greater susceptibility to injury, and an increase in body fat. The good news, however, is regular exercise enlarges muscle fibres and will stave off the decline by increasing the strength of muscle you have left. In fact, in many cases, strength training has been proven to reverse the loss of muscle mass and bone density due to aging. The press-up is a core exercise in any fitness professional’s arsenal. The origins of the press-up are not totally clear, although several known variations have been in existence for centuries. One school of thought is that the press-up as we know it today is a joining together of two popular yoga poses; downward facing dog (Adho Mukha Svanasana) and the upward facing dog (Urdhva Mukha Svanasana). The roots of yoga can be traced back over 3,000 years. Early examples of the exercise are also cited in Indian culture, where wrestlers would perform many hundreds of ‘Hindu push-up’ repetitions. Dands, as they are more commonly known, build massive upper body strength and endurance, and have been used by champion Indian wrestlers for years. For the record, the phrase ‘push-up’ was first recorded in the United States during the period from 1905 to 1910. However, some forty years later, the (correct) phrase ‘press-up’ first appeared in the British lexicon. A press-up (a common calisthenics exercise) is a compound strength-training exercise that involves raising and lowering the body using the arms while facing down in a prone, horizontal position. One of the greatest benefits of press-ups (and strength training in general) is that of injury prevention. Nothing aids the skeletal structure more than strengthening the muscles and connective tissue around a specific area. This strengthening naturally occurs through regular training and from an aerobic standpoint performing moderate to high sets of press-ups will provide an effective cardiovascular workout too. As an additional benefit, bone density is also improved, which vastly decreases the potential risk of injury in the specific body areas. Press-ups are often considered difficult because the core stabiliser muscles of the hips and shoulders must be used to balance the body. Press-ups use all the muscles that make up the shoulder girdle and strengthen the smaller stabiliser muscles of the shoulder. The shoulder is responsible for daily actions such as lifting, pushing and pulling. Press-ups help to develop strength and flexibility for the wide range of motion required in the arms and hands. This strength and flexibility is especially important because the shoulder is extremely unstable and far more prone to dislocation and injury than other joints. Press-ups, although not a major contributor to deltoid development, are still an ancillary benefit to this muscle. The serratus anterior muscle originates on the surface of the upper ribs at the side of the chest is largely responsible for the protraction of the shoulder blade. Traditional press-ups help to develop the serratus anterior, which is occasionally called the ‘boxer’s muscle’. When performing press-ups, the lower back muscles contract to stabilise your body; this has a secondary benefit of stretching the abdominal muscles and developing core strength. However, biceps are not developed to any significant degree while performing traditional press-ups. Press-ups are functional, multi-joint, multi-muscle movements that mimic the actions and movements we perform on an everyday basis. In a nutshell, press-ups give you more strength to carry out the activities you do every day: lifting, carrying, moving, cleaning and gardening. Press-ups are an integral part of military physical fitness and many military systems around the world train daily with this classic exercise. All branches of the British armed forces, Army, Royal Navy, Royal Air Force and Royal Marines, require press-ups on their physical fitness standard tests. Royal Huddleston Burpee adapted the Front Leaning Rest (FLR) position by starting in the standing position, thus creating the Burpee. The FLR is sometimes known as the press-up – although it is really the start position of a press-up. Frequency: it is very important to allow your body time to recover from your daily workouts. Muscle tissue is broken down during exercise but will rebuild itself during periods of rest and recovery. Working the muscles on consecutive days will hamper the rebuilding process. Current convention suggests the body needs 48 hours to recover and adapt to the stress of strength training. Wrists Hurt: try closing your hands and making a fist to perform the press-ups. This way your body weight ends up on your knuckles instead of your palms, thus avoiding the wrist extension motion. 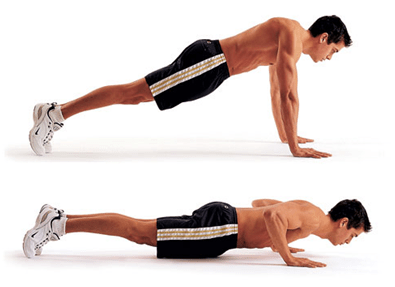 Ensure that you do this type of press-up on a padded mat, plush carpet of even a folded towel. Chest to the Floor: good form should put your chest within an inch or two of the floor. There is no specific need to touch the floor with your chest, but aim to form a 90 degree angle at your elbow joint. Speed: press-ups should be performed in a slow, deliberate manner. Rather than bouncing up and down, it is important to maintain full control as you lower and raise your body. As a rough guide, each phase – both up and down – of a single press-up should take a couple of seconds. Breathing: it is important to breathe in during the descent and breathe out on the ascent. Make sure you do not hold your breath and make every effort to breathe rhythmically throughout the exercise. Head Alignment: your head should be held in a neutral position – this is, not looking forward, up or down at your navel. Looking slightly above your hands reduces the strain on your neck muscles. Elbows Hurt: at the top of the movement the arms should be almost straight, but be careful not to lock or snap them in place. Also, be sure to keep your elbows close to your body and not splayed out past your hands. If your form is good, you should feel a contraction in your triceps muscle. ‘Good’ Pain: can be the feeling of being ‘pumped’ as your muscles fill with blood during exercise, or it can be the mild feeling of fatigue as the lactic acid burn sets in. Recognise these sensations and learn to thrive on them. ‘Bad’ Pain: on the other hand, is any sharp pain or spasm, or pain that moves quickly into the shoulders, arms or hands – these are definite warning signs. Repeat the raising and lowering action of the exercise until you reach your maximum, set or repetition limit. 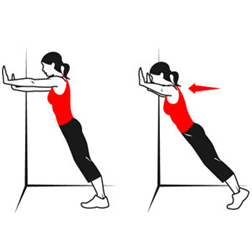 Wall press-up: the ‘wall’ press-up dramatically reduces the pressure on the arms, upper back and abs. The closer you stand to the wall, the easier it is to perform, but remember, it is still important to be aware of your body alignment as you perform this press-up. Counter/Table Press-up: Slightly more challenging than the wall press-up but still offering several degrees of assistance, the counter or table press-up is a very effective exercise that will target your upper back muscles and engage your triceps. Bench/Chair Press-up: For the next degree of difficulty, swap the table for a low bench or chair to support your arms while you perform regular press-ups. This type of press-up allows you to really concentrate on the press-up motion; all without the strain of the classic version. Knee Press-up: To reduce the lifting load by about 50%, you can modify the traditional press-up position by doing the exercise on your knees. Keeping a straight line from neck to torso is still important, pay attention to correct body alignment. Table 2 highlights the population averages for males and females of selected age groups. How Much Weight is Lifted When Performing Press-ups? Many individuals hold press-ups in the up position. But the information above indicates that one would be lifting more weight in the down position. As a result, you might try holding a press-up in the down position to offer more challenge in your press-ups. Changing hand positions was explored by Cogley et al. (2005). These researchers looked at performing conventional press-ups with a narrow hand placement compared to shoulder width or wide hand placement. Results found that an increased number of muscles were activated in a press-up with a narrow hand placement compared to wide hand placement. However, completing press-ups like has an increased risk factor due to torque at the elbow. There are zoology observations that certain animals emulate a push up action. Most notably various taxa of the Fence lizard exhibit this display, primarily involving the male engaging in postures to attract the female. The Western fence lizard is a particular species that also engages in this behaviour (in Mexican Spanish push-ups are called ‘lagartijas’, which means ‘lizards’.). The first record for push-ups was documented by Guinness World Records: 6,006 non-stop push-ups by Charles Linster in 1965, October 5. The record for the most push-ups non-stop was 10,507, set by Minoru Yoshida of Japan in October 1980. Minoru Yoshida’s World Record was the last of its category for non-stop push-ups to be published by Guinness World Records. A new category, “Most Push-ups in 24 Hours,” has since been introduced. The current world record for most push-ups in 24 hours is by Charles Servizio (USA) who achieved 46,001 push-ups in just 21 hours, 6 minutes on 1993, April 24 to 25. The world record for most two-handed backhand push-ups in one hour is 1,940 by Aman Sharma of the UK, set in 2007. Doug Pruden (Canada) performed 1,025 one-arm push-ups on the back of the hand on 8 November 2008. Take the 22 Push Up Challenge for 22 days or more: https://activeheroes.org/22pushups/. Record Holders (an alternative to the GWR): http://www.recordholders.org/en/list/pushups.html. Guinness World Records (GWR): http://www.guinnessworldrecords.com/world-records/most-push-ups-in-one-hour. Push Up Hall of Fame: https://www.facebook.com/TheOfficialPushUpHallOfFame. Paddy Doyle (former British Para): http://www.recordholders.org/en/records/doyle.html. The contraction of a muscle with movement against a natural resistance. Isotonic actually means ‘same tension’, which is not the case with a muscle that changes in length and natural biomechanics that produce a dynamic resistance curve. Aerobic exercise is usually prolonged exercise of of low- or moderate-intensity. Cogley, R.M., Archambault, T.A., Fibeger, J.F., Koverman, M.M., Youdas, J.W. & Hollman, J.H. (2005) Comparison of Muscle Activation Using various Hand Positions During the Push-up Exercise. Journal of Strength and Conditioning Research. 19, pp.628-633. Suprak, D.N., Dawes, J. & Stephenson, M.D. (2011) The Effect of Position on the Percentage of Body Mass Supported During Traditional and Modified Push-up Variants. Journal of Strength and Conditioning Research. 25, pp.497-503.